Save Marinwood-Lucas Valley - our community, our future: Judy Arnold has Plenty of Skeletons in her Closet. Judy Arnold has Plenty of Skeletons in her Closet. Northern Novato has been blanketed with mailers detailing a 13-year-old shoplifting incident involving supervisorial candidate Judy Arnold. Craig Miller of Novato, a supporter of candidate Pat Eklund, mailed 606 copies of his letter outlining the old case to neighbors in the Atherton and Black Point areas this week. The letter describes a 1993 shoplifting citation against Arnold, which was dismissed later. It also describes "several civil, criminal and eviction cases during the past two decades" in which Arnold was involved, referring to a 1992 civil suit against Arnold and her husband following a real estate deal. Arnold dismissed the letter as an 11th-hour smear tactic by Eklund, whom she believes orchestrated the effort. "This shows how desperate my opponent is," Arnold said. "She almost lost in June, and now she's so desperate that she's bringing up 13-year-old matters that were dismissed. This is old news. "All of those problems are in the past." Eklund denied any knowledge of Miller's actions. "Councilwoman Arnold knew that when she entered public service, her life would become an open book," said Eklund who, like Arnold, is a member of the Novato City Council. "The voters deserve an explanation." Eklund said she has known Miller since 1996 but added he is not affiliated with her campaign. Miller made two donations to her campaign totaling $750, Eklund said. The shoplifting citation against Arnold surfaced during her first campaign for county supervisor in 1996, when she lost in the primary election for the seat ultimately won by Steve Kinsey, who still holds the post. Arnold's citation involved shoplifting at Longs Drugs in Novato. The district attorney's complaint said she took merchandise "with the intent to steal said merchandise." The Marin Municipal Court dismissed the charge after Arnold attended a "self-awareness" class and served six months' probation. Arnold maintained her innocence of the charge in a 1996 Independent Journal interview, and said she had only agreed to participate in the class and probation in order to avoid an expensive jury trial. Miller said his wife discovered a 1996 newspaper article that included the charges while doing online research. He said he decided to publicize the information after local newspapers endorsed Arnold. "Quite frankly, I'd hoped the media would have done their homework, rather than an average citizen having to reveal this information," Miller said. 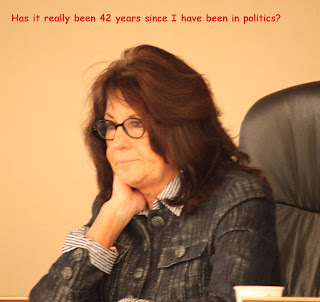 "After I saw the editorials in the Marin Independent Journal and the Novato Advance endorsing Judy Arnold, it took me over the edge. I felt compelled to do something." Arnold believes the information came from the Eklund campaign. "Of course it came from Pat Eklund," Arnold said. "She's desperate. She's not getting the support she thought she would get. She's not getting the endorsements from newspapers, elected officials, or from Novato. "She's going to do whatever she can, including muckraking up a 13-year-old story." Arnold adds that she does not expect the incident to become a campaign issue. "The matter was dismissed, and I think people are aware of that," she added. Political analyst Brian Sobel believes the incident could end up backfiring on the Eklund campaign, even if it is not the source of the letter. "The timing is suspicious," said Sobel, a Petaluma-based consultant. "If a person had information on these allegations, why wouldn't they choose to release them weeks ago, when all parties had time to respond to it? To do it this late in the campaign could turn off voters." The pattern follows that of 1996, when the petty theft charge against Arnold was published three weeks before the election by the Point Reyes Light. At the time, Arnold accused the weekly paper of conducting "a smear campaign against me." Sobel said candidates "tend to know what's going on," and added, "When someone comes out of the woodwork to lob charges like this, it's highly unlikely that they're acting alone." But Miller maintains that he acted independently. "I have nothing to do with the Pat Eklund campaign," he said. "But I'll vote for her."